Search Engine Optimization(SEO) has evolved a long way from being a mere keyword ranking methodology to providing useful and relevant content to the user. Content strategy, citations, relevant back links and social popularity and engagement are important aspects of SEO and high search ranking can be treated as an end-result of a successful SEO strategy. Let’s start by defining what SEO means in the most current sense…. SEO is the process of optimizing your website to rank higher on search engines like Google & Bing. Content, Citations & Back links are the central aspects of any SEO campaign. Good quality content that is unique, useful and engaging and that is optimized as per search engine guidelines will rank higher on search engines. Search engines love to show content that is useful & popular. As a website owner, if you spend your effort in giving the user a good experience by providing them with useful content, good browsing experience, up to date website content, and if your website is designed as per Google webmaster guidelines, your website have a great chance of ranking higher on search engines. We will come up with relevant keywords used on search engines relating to your product or service. Citations or online listings are an important aspect of SEO. For e.g. Google+, Yelp, Bing, Yahoo etc. We help you manage accurate information on your citations. We will provide consultation on your website technical aspects like speed, hosting, code, etc. to ensure your site ranks well on search engines. For e.g. a flash site or a slow loading site will not rank very well no matter how well its optimized. We will help you fix your website as part of SEO. We will come up with a plan for social media posting, engagement and paid promotions. Facebook, Instagram, LinkedIn, Pinterest are some of the social media channels we use. Check ranking for ‘auto glass repair toronto‘ on google.ca. Our client Advantage Auto Glass is ranking on Top 10! Check ranking for ‘bankruptcy lawyer toronto‘ on google.ca. Our client Rogerson Law Group is ranking on Top 10! Sample Client Result – 9x Increase in Traffic, 4x Increase in Business from SEO! 1. Does SEO Work or Is SEO Dead? 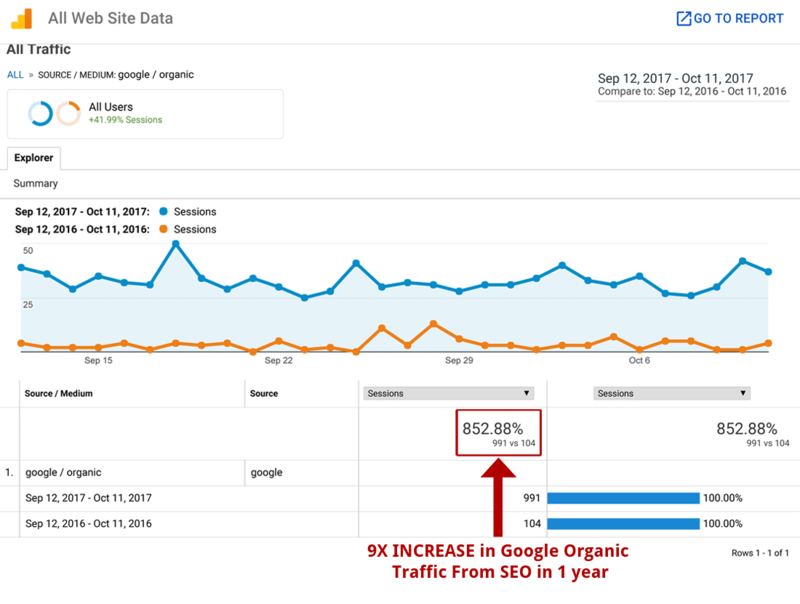 The above client results (4x Increase in business from SEO!) make it fairly obvious that SEO works! Old SEO tactics are dead but SEO is not dead. SEO is evolving with constantly changing search engine algorithms. While less work was involved in the past and ranking fluctuations were minimal which meant websites would stay longer on Top 10 searches. Now, constant work is required to ensure top 10 rankings on search engines. As a SEO Company, we need to ensure we are at the top of the game to get our client the best results they deserve. 2. Will SEO get results for my business? SEO will get results for your business if your product or service has a search market share i.e. people searching for your service on search engines. So the first step is to get in touch with us to find out about the search market potential for your business. Contact us today to get a free consultation. 3. How long does SEO take to get results? Search Engine Optimization (SEO) is most often referred to as an investment with long-term benefits. SEO can get you results in typically 3-6 months or longer. 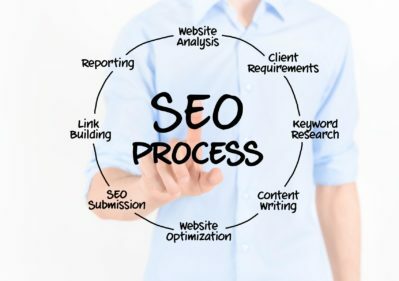 Contact Toronto SEO Consultant – Pat’s Marketing at 1-888-488-7287 to find out about the potential of SEO for your business. 1. Content Strategy – Creating Engaging Content! Content is a crucial component of SEO & ensuring higher engagement levels on your website! At Pat’s Marketing, we can help you come up with a great content strategy and help you increase your site engagement levels. We have a team of highly experienced writers who can write compelling content that will highlight the positives of your business in a way that inspires conversions. Our writers are also trained in SEO techniques. They deliver content that search engines love, and thereby drive good traffic to your website. Quality back links are still important and do play an important role in ranking. Back links from credible and relevant websites lend your website a higher trust factor and a stronger overall search profile. A very careful approach is required to ensure quality and highly relevant links or you run into the risk of a penalty. As a thumb rule, avoid paid links and links to irrelevant/fishy websites or websites with too many outgoing links. Stuffing and unnatural use of title tags, description etc. will cause search engines to simply ignore your website or penalize your site at worst. Your domain age and history is a strong ranking factor. A longer age with a good history is quite useful. Online reviews and citations are seen as a signal by search engines. So having positive online reviews on sites like Google Places, Yelp, Citysearch etc. will help you make a better search profile and add trust to your site. Nonetheless, good reviews will also help you increase buyer confidence and trust in your services and will help you attract more online business. Local directory listings on Google+, Yelp, Bing, Merchant Circle, CitySearch etc. can help you rank on local searches. NAP refers to name, address & phone #. To rank higher on search engines, NAP needs to be consistent across all directories. Social factors from websites like Facebook, G+, Twitter and others provide search engines with important data related to the social popularity, engagement and like-ability of a business. These factors are often used as a measure of your content popularity and engagement and contribute towards your overall search profile. For more information on social media marketing, please visit our social marketing service page.